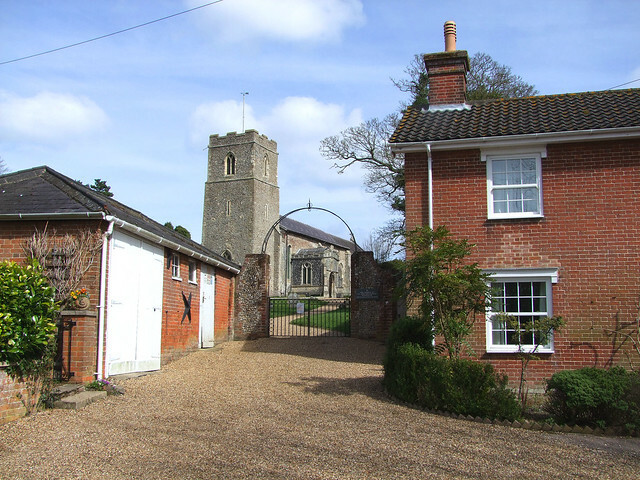 I always enjoy revisiting Badingham church, not least because of the setting in this quiet, tiny village to the north of Framlingham. 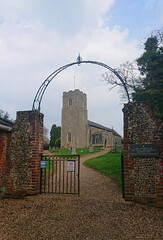 The church is approached between two old houses under a wrought-iron arch. 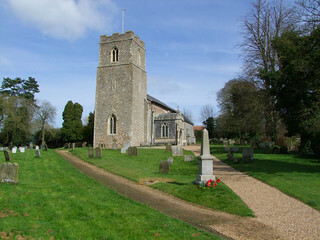 These give the churchyard an almost urban feeling of enclosure, and it is a steep climb up to the church, a suggestion that this church stands on the site of an earlier structure whose purpose may have been defensive and pre-Christian. 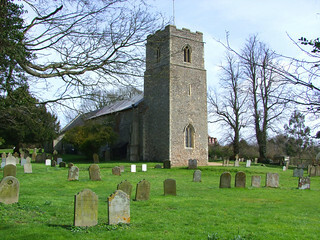 St John the Baptist is generally an early completion of the late 13th century, with Norman details surviving to show that it was not a total rebuild. It was tinkered with on the eve of the Reformation, with Perpendicular windows and a kind of pseudo-clerestory added to light the rood. 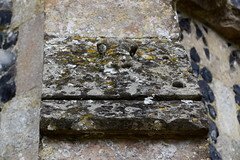 The most striking survival of this period is the lovely porch, which has some unusual details. 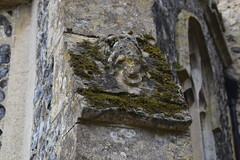 A dragon and a woodwose face off in the spandrels, but more curious and interesting are the buttresses either side. 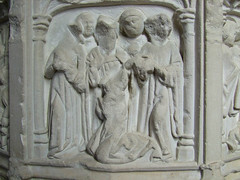 That to the east appears to show a dog eating out of a bowl, but it is intended as a tiger with a mirror, a symbol in the medieval bestiary of vanity. 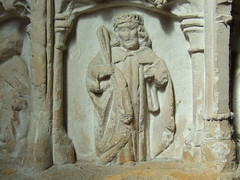 That on the other buttress is very badly damaged, but appears to show the lower half of a figure with a tail, thus almost certainly a mermaid. 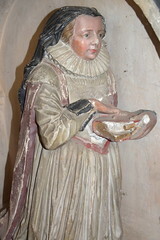 Her upper half would also have held a mirror, making her another symbol of vanity often paired with a tiger as on the bench ends at Wiggenhall St Germans in Norfolk. 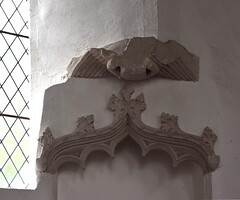 Inside the porch are two corbels, perhaps late Norman, possibly from an earlier entrance, more likely reset here from elsewhere. One appears to be a cat, the other looking like nothing so much as an Aztec god, but perhaps a man opening a door, or even an acrobat. Stepping inside can be a bit unnerving. 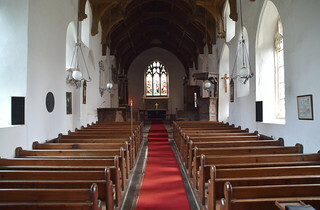 The church slopes steeply up towards the altar, almost a metre between the west and east end of the nave. Coupled with the absence of aisles, this accentuates a feeling of narrowness. The dedication makes this even more interesting, because churches on previously pagan sites may have been dedicated to St John the Baptist deliberately because his feast day falls so close to midsummer. It must have seemed entirely natural to local people that, on this day of all days, their building should have faced the rising sun. 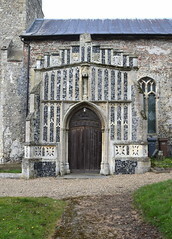 Because the church is so small, the fact that it contains one of Suffolk's thirteen seven sacrament fonts might even make it feel as if the building were specifically constructed to contain it. 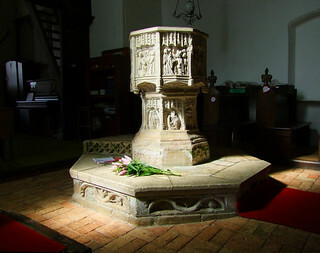 This is not so of course, but of all East Anglia's other seven sacrament font churches, only Weston is smaller. 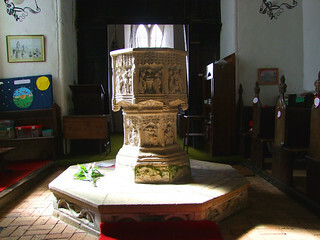 Although Westhall's font is my favourite of this series, Badingham's runs it a close second, mainly because it has suffered less damage than many of the others, but also because the reliefs are so characterful. 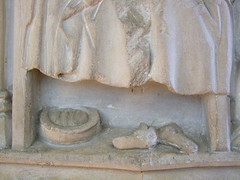 In the Last Rites panel, under the bed, we see the dying man's shoes and chamber pot, and his wife weeps into a hankie. 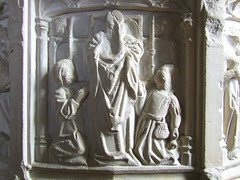 In the Mass panel one figure holds the sacring bell, and we see two observers peering over the screen behind. In an instant it is as if we have been transported back to 15th century rural Catholic England, and it is not hard to imagine this scene happening in this very church. 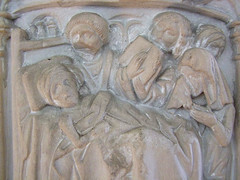 On the Baptism panel a woman holds a chrysom cloth, and this is also one of several seven sacrament fonts in Suffolk that depict the devil fleeing on the Penance panel. 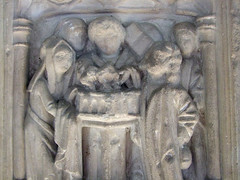 The man's hat on the Matrimony panel helps to accurately date the whole piece. 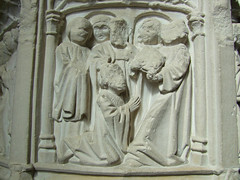 The shaft and base contain many other images, including St Edmund. If this font was in the Victoria and Albert Museum it would be considered a national treasure, and we would all travel to London to see it. But of course there is more to this building than its font. 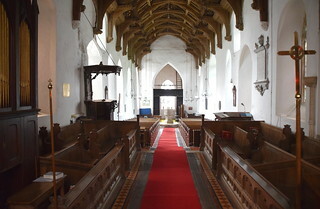 Cautley thought the hammerbeam roof the most perfect example of a single hammerbeam in England. 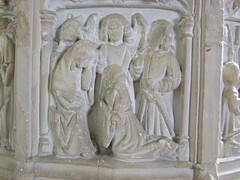 The early 20th Century angels replace those ordered down by William Dowsing in September 1644. 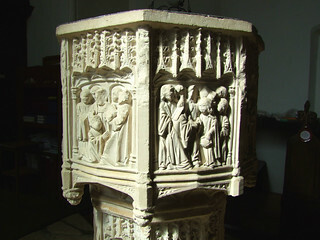 That Dowsing did not remark on the font may be because it had been plastered over a century earlier by the Anglican reformers. As you walk east, a large expanse in the north wall is surmounted by a crocketted arch. Mortlock describes it as an image niche, but I do wonder if it could be the entrance to the roodloft stairs. 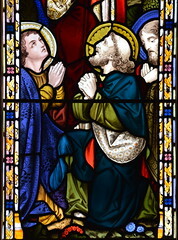 Opposite is an unusually good window by Hugh Easton of 1928 depicting the young Christ meeting the young St John the Baptist. 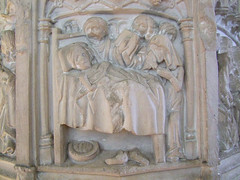 The chancel was the 1880 work of E L Blackburne, an avowed medievalist. The success of his work here means it is hard to tell unless you know. 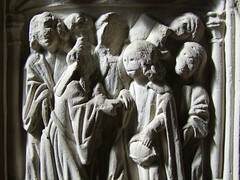 The east window depicts scenes from the life and death of St John the Baptist. 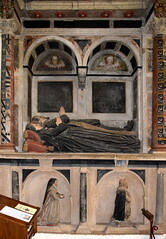 William Cotton and his wife lie up in the sanctuary on a vast 1620s bed in the north wall. 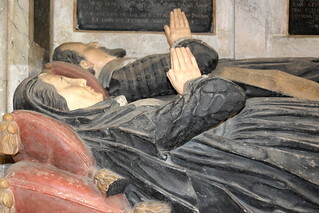 They seem a world away from the earlier figures on the rich 1440s Bardolph memorial across the fields in the grand church at Dennington. 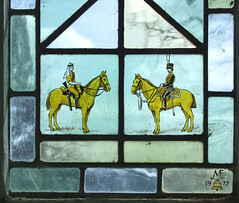 Curiously domestic, their hands are big, their piety outweighs their grace. Their flawed humanity, at once rustic and familiar, perhaps symbolises better than anything the difference between the reverence afforded to the very wealthy either side of the Reformation divide, and our artistic endeavours to remember them.